Home » Movies, Pop culture » Indy 5 in 2011 and new Monkey Island games, wow! Indy 5 in 2011 and new Monkey Island games, wow! For some weeks there have been rumours about a fifth Indiana Jones movie and today The Insider is reporting that Harrison Ford will indeed play the famous archaeologist one more time. Shooting will not begin until next year for a release in 2011. This is great news. 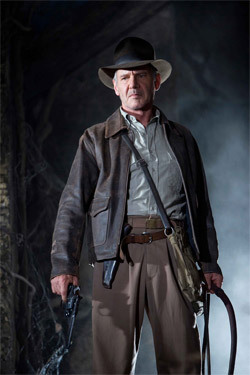 Despite all the negative criticism that Crystal Skull received I still liked that film a lot. Here’s hoping that the last one with Ford will be even better and that he’ll pass on the fedora to Shia to continue the Indiana Jones franchise. I also just found out at TheRaider.net that LucasArts is reviving their classic adventure games by making them available for the first time ever as digital downloads. The first round of releases will take place on July 8th (on Steam) and will include Indiana Jones the the Last Crusade (1989), Indiana Jones and the Fate of Atlantis (1992), Loom (1990) and The Dig (1995). I have fond memories of playing all four of these games and it’s great that they’re finally re-releasing them. And that’s not all … There’s also an enhanced re-make of the first Monkey Island from 1990 on the way: The Secret of Monkey Island Special Edition (PC and XBox Live) will be released on July 15th and will feature completely new art in the style of the original game presented in 1080i widescreen, a re-mastered score and a new streamlined interface. And what’s cool is that at any time during the game you can switch between the old 256 color version and the enhanced version. Wow! This entry was posted on Monday, July 6th, 2009 at 3:44 pm CET and is filed under Movies, Pop culture	with tags . You can follow any responses to this entry through the RSS 2.0 feed. You can leave a response, or trackback from your own site.